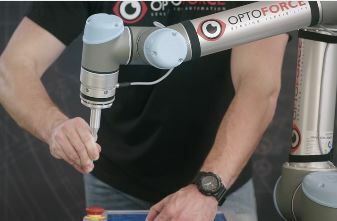 OptoForce: Cobot Sensors, No Programming Experience Necessary - Allied Automation, Inc.
OptoForce brings the sense of touch to industrial robots so that you can automate tasks that would otherwise require the dexterity of the human hand. They build products that are easy to use so that you can save time when programming the robots. 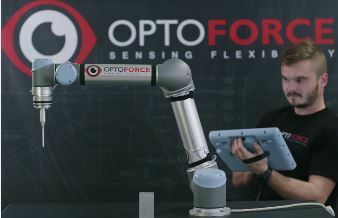 OptoForce products are Universal Robots Certified. OptoForce is a pioneer in industrial automation by providing robot accessories for industrial light weight robots. 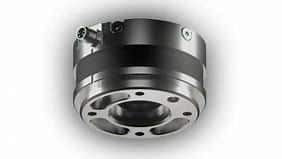 With our force torque sensor you can automate tasks which require high precision. The robot programming is very simple thanks to the OptoForce software package. The following video will show you how the robot detects the presence of a specific object with the help of the OptoForce Presence Detection solution and the OptoForce Force Torque Sensor. With this solution it is also possible to find the object even if it is moved. The OptoForce Presence Detection solution helps you in the industrial automation. 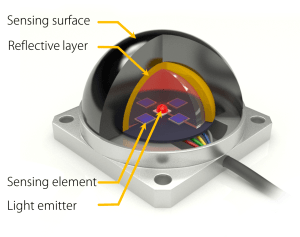 Call us at 800-214-0322 for more information about our OptoForce sensors.